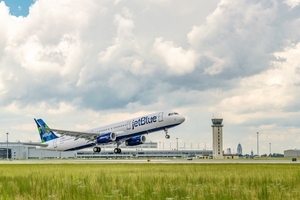 NEW YORK, Sep. 20 /CSRwire/ - JetBlue (Nasdaq: JBLU) today received its latest A321 aircraft from Airbus’ U.S. A320 Family production facility in Mobile, Ala. The acceptance flight followed by JetBlue’s scheduled ferry flight, taking place on September 20, marks JetBlue’s first-ever flights fueled with renewable jet fuel blend. The fuel for these flights, provided by Airbus and certified by Air BP, consists of 15.5 percent renewable jet fuel blended with traditional jet fuel. Four more A321 aircraft will be delivered to JetBlue from Airbus’s U.S. facility by the end of 2018. All of these customer acceptance and delivery flights will be fueled with renewable jet fuel. The Federal Aviation Administration (FAA) has approved renewable jet fuel safe for use. Renewable jet fuel is chemically equivalent to conventional jet-A fuel, and poses no difference in performance or safety. To date, thousands of commercial, revenue flights have flown on different types of renewable jet fuel. Following the deliveries in the U.S. to JetBlue, Airbus will determine the next steps toward offering this option to more customers taking aircraft deliveries from Mobile. Longer term, Airbus envisions supporting industrial production of sustainable fuels for aviation in the U.S. In another commitment to sustainability throughout the aircraft’s lifecycle, Airbus also announced its U.S. Manufacturing Facility in Mobile officially received its ISO 14001 certification. Airbus was the first aircraft manufacturer to be certified ISO 14001 for all its sites, products and services. JetBlue is proactive about mitigating the impact of changes in the fuel market by flying more efficient aircraft, optimizing its fuel consumption, moving to renewable jet fuel, and more. With an aviation industry-wide goal to cap net greenhouse gas growth from 2020 onward, renewable jet fuel is a key aspect of JetBlue’s emissions reduction strategy. In 2016, JetBlue signed a deal and made an offtake agreement with SJ Preston for renewable jet fuel at New York’s JFK Airport. JetBlue’s Focus on the Environment - JetBlue depends on natural resources and a healthy environment to keep its business running smoothly. The airline is committed to taking steps to address the emission of greenhouse gases (GHGs) from its flights and empowers and inspires its customers and crewmembers to offset GHG emissions when they fly. The airline is constantly looking for ways to become more fuel efficient and embrace efficient technologies. For example, JetBlue planes feature Airbus' Sharklets, which improve aerodynamics and cut fuel burn and emissions. For more on JetBlue’s work to reduce emissions, visit jetblue.com/green. JetBlue is New York's Hometown Airline®, and a leading carrier in Boston, Fort Lauderdale - Hollywood, Los Angeles (Long Beach), Orlando, and San Juan. JetBlue carries more than 40 million customers a year to 103 cities in the U.S., Caribbean, and Latin America with an average of 1,000 daily flights. For more information please visit www.jetblue.com.